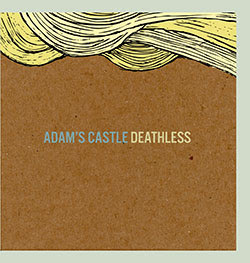 Adam’s Castle's new LP, Deathless, is fantastic and it's available on Triple Down Records. 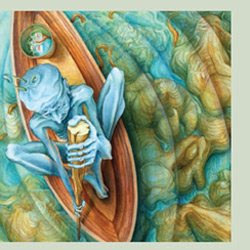 The album came as a limited edition CD pressing with individually numbered, silk-screened packaging which has some amazing artwork. I have heard Adams Castle labeled as Math Rock, but to me they are more than a rhythmically complex, piano-based style of experimental rock music that emerged in the late 1980s. Their songs are like scores from a film, and that film is your life, it's my life and everything that is happening around us. Put on some headphones and take a stroll with Deathless blasting between your ears. You will see an entire new world scored by these masterminds of music, Adams Castle. Powerful, driving rhythms that just push the listener forward in time. Cascading drum fills and crunchy sweeping phaser bass lines that literary tug at your heart strings and banging piano that would turn Liberace straight. I tried to order the LP a few months back and ran into an website snafu. I couldn't add anything to my cart but with one short but brief email I was told it was back up and running and I would receive a reward for my findings. Sami Jano shipped me a free copy of Gold and GunMetal, a side project of Jano's. This LP is amazing as well. It adds an element of vocals and guitar to Jano's brilliant piano playing and I humbly suggest picking this up as well. Kudos to two fantastic LP's gentlemen and thanks again for the Gold and GunMetal LP.